Yesterday two hibakshas (survivors of the atomic blasts) from Hiroshima spoke at the University of Denver where I heard them. They were brought to the university thanks to Dr. Randall Kuhn, director of the Global Health Affairs Certificate Program of the university’s Graduate School of International Studies. Yoshioka was sixteen years of age on August 6, 1945 at 8:12 am when the first nuclear bomb exploded 600 meters (approximately 1800′) above the center of downtown Hiroshima. Yoneda was five. Both were within a mile of the blasts epicenter and somehow survived. Yoshioka was in a boat on one of the rivers that flow through Hiroshima. He was initially knocked out by the blast. Yoneda was in a hospital with his mother at the time. The blast leveled the hospital but he and his mother somehow survived in the rubble. A nurse was able to clear away enough debris to free them. A few minutes later the debris burst into flames consuming whomever had survived the blast. That they are both alive today to tell the tale is something close to a miracle. Both spoke about the horrors that followed – both immediate and long term – an unending nightmare of unspeakable proportions. It is difficult to sit and listen to all that suffering and it gives but a hint of the horror, the utter devastation and suffering that ensued. Like the other tragedies of World War II, Auschwitz and Buchenwald, the Nazi siege of Leningrad, the SS torture chambers, the fire bombing of Dresden, the Warsaw Uprising of April 1944, the dropping of two atomic bombs on Japan – one on Hiroshima on August 6, 1945, the second on Nagasaki on August 9, 1945 – are hard to conceptualize. Therefore their significance is difficult to appreciate. – Because we live in an age of nuclear and other weapons of mass destruction. – Because since the end of the Cold War, the actual proliferation of nuclear weapons has grown dramatically with no end in sight while the awareness of the danger of a nuclear war has receded from the public consciousness to a significant degree. – Because the possibility of using nuclear weapons has against Iran to halt its nuclear energy program has been raised by the Bush Administration and supported by Democrats (ie – no option is off the table – this from Hillary Clinton). – Because the miniaturization of nuclear weapons has developed dramatically in the last 20 years making their use more tempting for some. – Because the United States, more so than any country in the world, continues to aggressively pursue nuclear superiority (unilaterally abrogating the ABM Treaty, pursuing the nuclearization of space, preparing to install nuclear missiles in Poland and Hungary supposedly to `protect’ Europe from Iran, etc, etc). – Because many more countries are on the verge of developing nuclear weapons or could very quickly among them Brazil, Argentina, Egypt, Turkey, Japan, S. Korea, Germany just to name a few. Because while it complains of Iran starting a nuclear energy program, Israel says nothing about its own substantial nuclear arsenal. – Because nuclear war is playing for keeps with the fate of the earth. – Because in dropping two atomic bombs on Hiroshima and Nagasaki, despite all the rationales offered to defend the decision, the United States committed a crime against humanity, one it is still very much in denial of admitting to. Yoshioka and Yoneda stuck rather strictly to the grim human consequences of the Hiroshima bombing and, as is their approach, rarely made other political statements. Yoshioka did come out clearly and unequivocally against reversing Article 9 of the Japanese Constitution, the article which prohibits Japan from expanding its military beyond defensive purposes. In recent years the US has wanted to expand US-Japanese military cooperation in Asia in hopes of putting together – either formally or informally – some kind of anti-Chinese military front, an East Asian updated reworking of the Bagdad Pact (which failed). The recent nuclear agreement with India go in the same direction more or less. During the Cold War pleas of nuclear disarmament were essentially targeting the US-Soviet nuclear arms race. The collapse of the USSR and the completion of significant – if incomplete – US-Soviet disarmament, due largely to Gorbachev’s efforts were hopeful signs in those days (late 1980s, early 1990s). But the hopefulness was short- lived and now the nuclear danger is spreading again and like wildfire. The United States and Israel would like us to believe that the greatest current danger comes from Iran’s nuclear energy program despite the fact that Iran has only enriched uranium to the industrial standard of 3-4%, not the 90+% needed for weapons grade material. Nor is there, according to the International Atomic Energy Agency any evidence of an Iranian nuclear weapons program (although it might be possible the Iranians are secretly proceeding in this direction – as virtually every country that has developed nuclear weapons in the past has done). Whatever Iran is doing it is small potatoes, virtually nothing compared to the nuclearization of the countries surrounding it. Twenty years ago, according to Mordecai Vanunu Israel already had 200 + nuclear weapons. That figure has never been denied by the Israeli government. Since its Dimona nuclear weapons plant has never stopped production, 20 years later the size of the arsenal could be considerably larger. Pakistan and India both have gone nuclear and while China and Russia are `technically’ not Middle Eastern countries, they are not far away. Furthermore, the United States, with its bases and port facilities in the region and in nearby Europe and Diego Garcia (from where it has bombed Afghanistan and could easily bomb Iran), with its floating arsenal in the Mediterranean Sea and Persian Gulf, its Trident submarines lurking around who knows where in the world, is probably the Middle East’s largest nuclear weapons power. The fact that a prominent Israeli, an editor of Haaretz – has recently called for regional de-nuclearization of the Middle East (including the Israeli arsenal) is a hopeful but essentially isolated sign. Nor is the danger of a nuclear war limited to the Middle East. The possibilities are of other areas of conflict – regional wars, the US use of tactical nukes in its jihad against the Third World – are growing at almost an exponential rate. Bombs using depleted uranium – not true nuclear weapons but still producing large swatches of radioactive contamination – were extensively used in Iraq both in 1991 and during the air attacks accompanying the 2003 invasion. 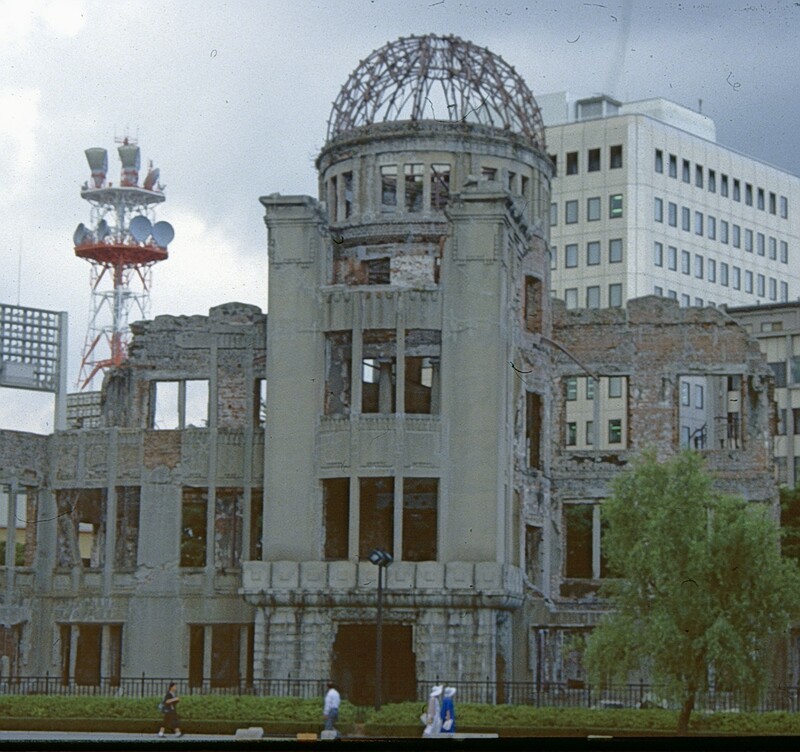 In these dangerous times the lessons of Hiroshima and Nagasaki appear to have been long forgotten. We should thank Yoshioka and Yoneda for reminding us, regardless how uncomfortable is the experience of listening to their tale of suffering. And I hope they are training another generation of Japanese – children of Hibakshas or Hibaksha II to continue to remind us – us being the world – of our responsibility to rid the world of these horrific human creations, before they destroy us all. 2.Email from a Japanese graduate student, former student of mine, concerning the above event.